In brief: Don't even try and go to BCD Tofu unless you are willing to eat alot of food. We really have no idea how the Koreans do it. The table was sagging with the weight of the ban chan, not to mention the lunch special of a plate of bulgogi and tofu stew and the extra seafood pajeon we ordered because we felt too cheap sharing one lunch special. Is it possible Koreans eat like this at every meal? 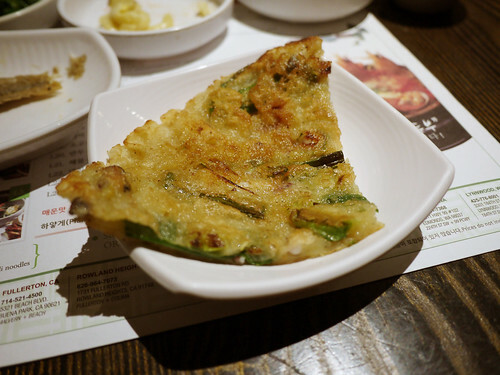 The seafood pajeon is very nice but the kimchi a little too sweet and the pieces are big. Which is ok if you like big pieces of kimchi but we find it less pleasurable than the more mouth size pieces. On related news, but not really, the ever bustling Kunjip was closed. They are relocating, apparently, down the block.